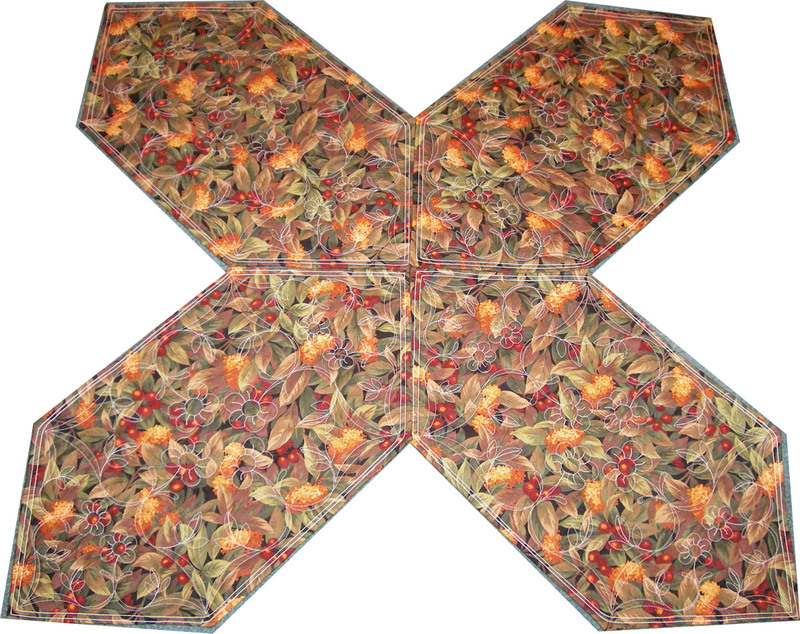 I finished up the four placemats on my practice backing and cut them apart. I was going to take them on vacation with us to hand sew down some binding edges but decided to try something else out. I wanted to try a faux binding. Here are the materials that I used. Some painters tape, an iron, some glue and of course my rotary cutter and mat. 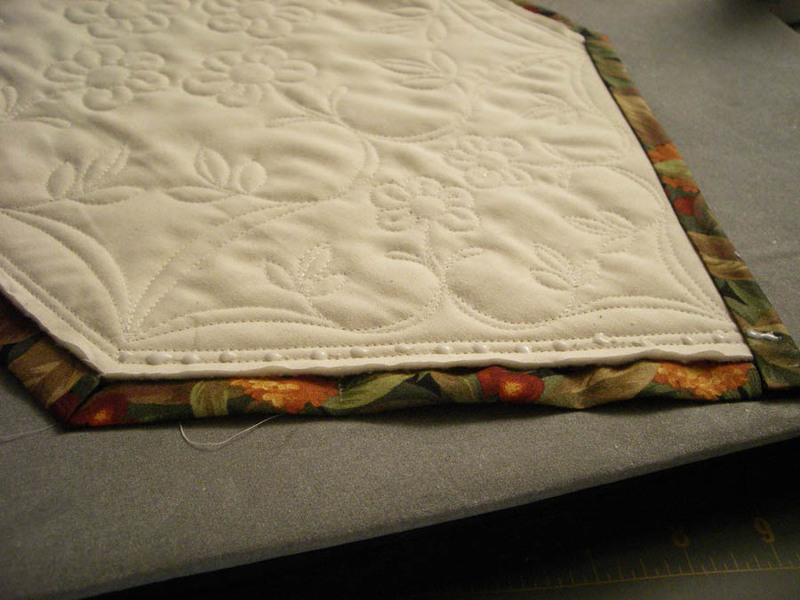 This method worked out well for me because the placemats had a double sewn edge all around the design. It would probably work with a single edge as well or even the square placemats. 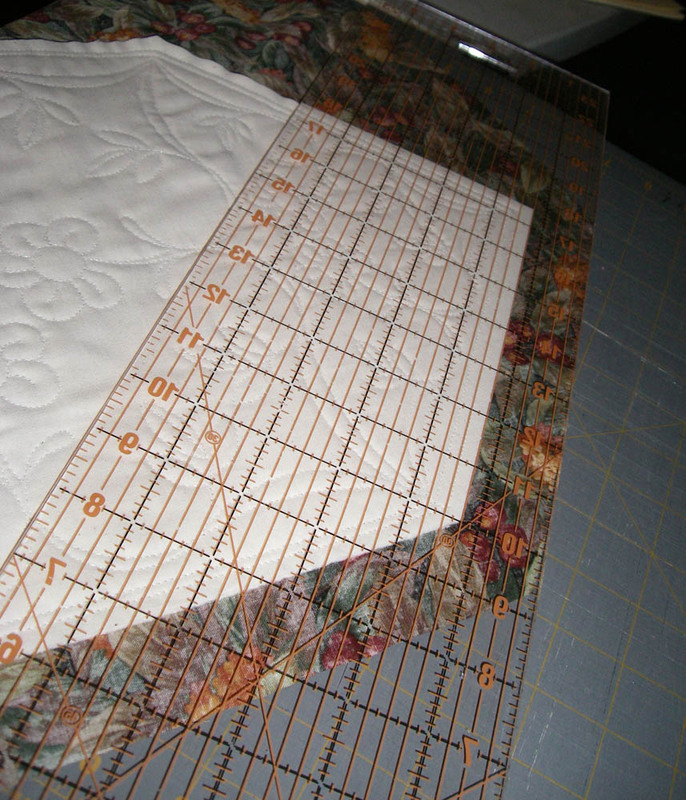 I started out by rough cutting the fabric (both top and backing) around the edge at least 2 inches wide. Then, on one edge at a time, I pulled back the top fabric until it was even with the seam. 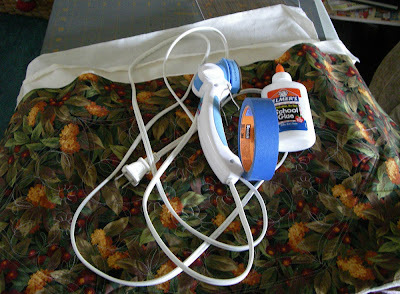 This is where sometimes I used the painter's tape to hold back the fabric temporarily. 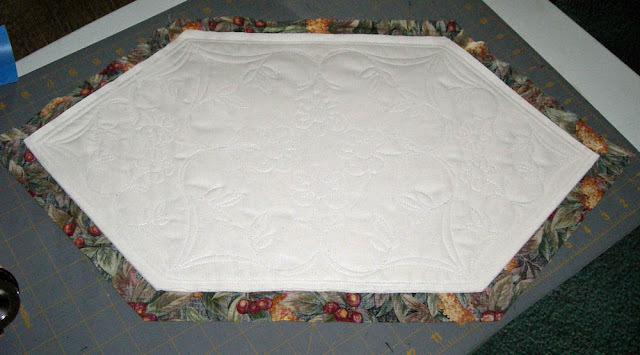 This gave me the ability to cut the batting and backing to 1/4 inch away from the outermost sewn seam on the placemat top. Repeat on each side of your placemat until it looks similar to this photo. This is the bottom of the placemat. 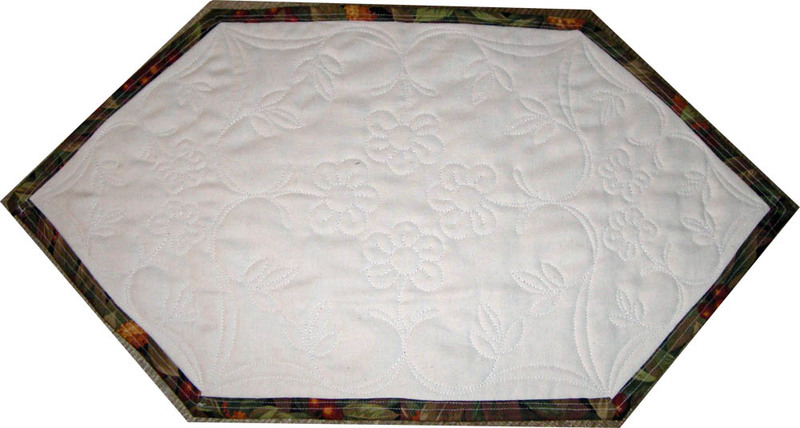 The practice backing fabric I had on the frame was a natural colored basic muslin. You can see the top fabric is still very long. 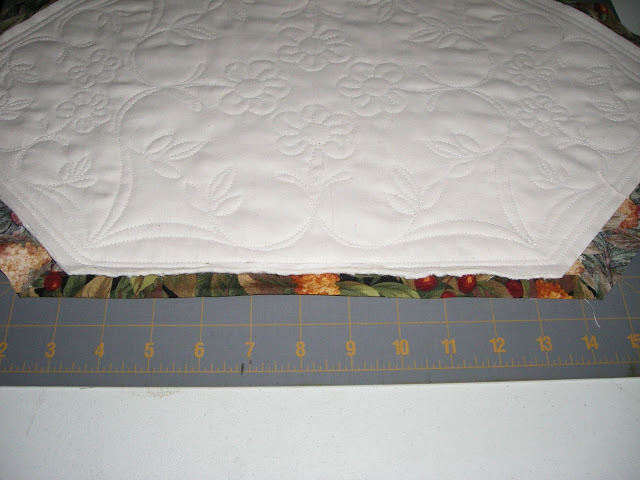 Now with the back of the placemat facing up, I measure 1.25" from the edge and trim the top fabric on all sides to this width. Next, one side at a time, I folded the front fabric and tucked it under the 1/4 inch lip of batting and backing and then ironed it flat. This takes a little practice. You could probably stop at the edge of the batting/backing but then when it's folded over the back, it would be a single fold of fabric. Make sure to iron flat so that it is easier in the next step. I left the photo below full size so you could probably zoom in once clicked on to get a better view of the folded back and ironed side. Repeat for each side. Next, one side at a time, I placed a line of glue (beads or full thin line) in between my two side seams that run the whole perimeter of the placemats. 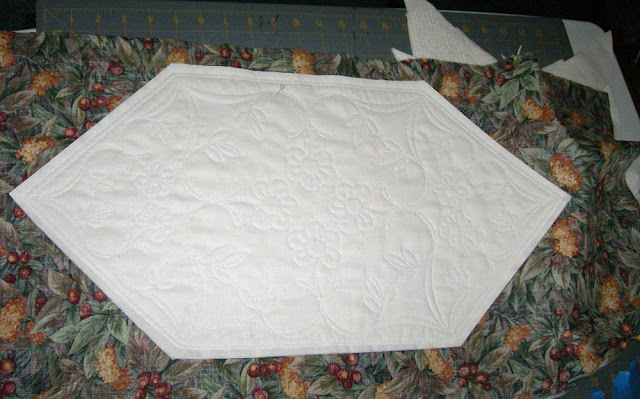 I'm going to fold back the folded side and glue and iron to secure in place. The heat really sets the school glue. 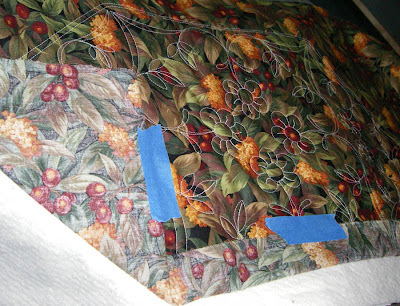 Wrap up the folded front fabric on top of the glued edge to set the faux binding. 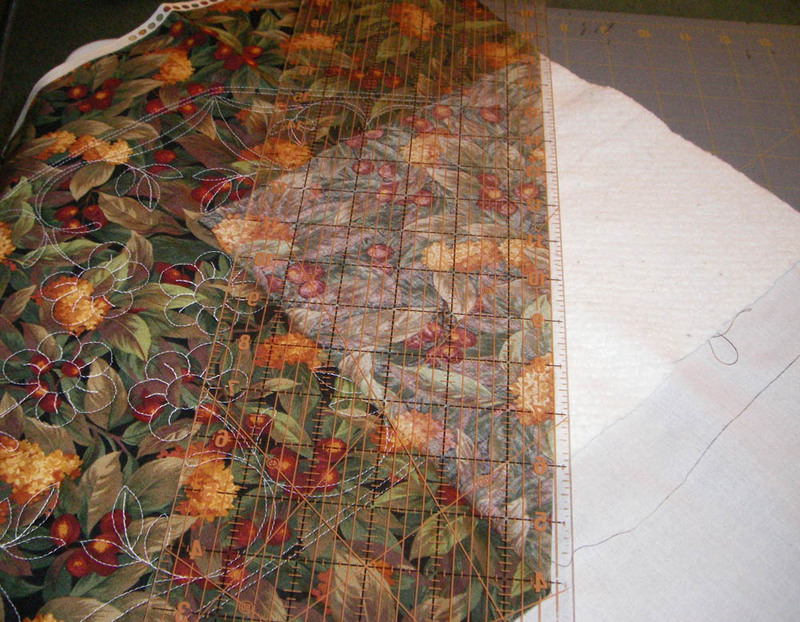 You want to make sure you cover the border seam since we will be retracing that seam to secure this fabric in place. Repeat on each side. The corners can be a little tricky but you just work with them and then they'll stay secured. Once all sides care glued to the back and secured. 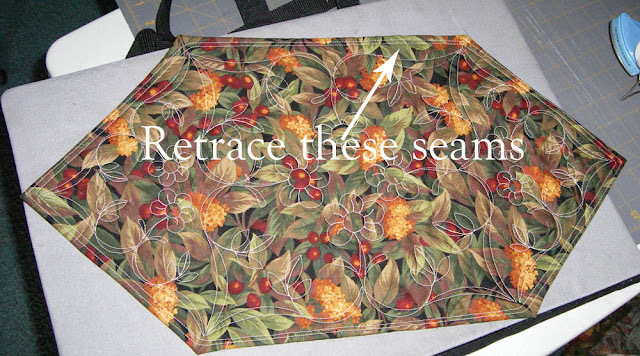 Take the placemat to the sewing machine and retrace the outlines seams around the edge of the placemat. I had two so I retraced both seams for added security. The first two had some ripples in the turn back of the faux binding but by the last two, I had it down pat and flat. 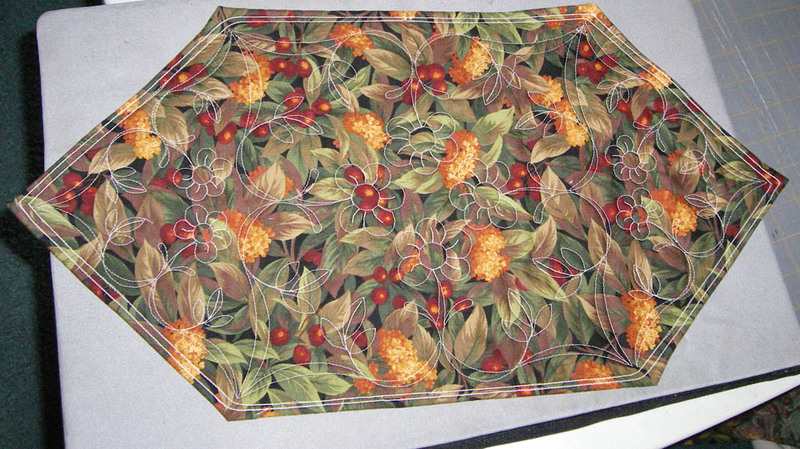 Here are the finished placemats. Once I got started, I finished them pretty quickly and hope to do more in the future. The great thing about these are that I consider them reversible now. I hope my MIL likes them for her fall table. Although I think I need to do two more since I believe she has 6 settings usually.